A. Use a tripod, if possible B. Use a speed suitable for action shots (2000 - 4000). C. Frame the picture so that the entire club, as it swings, is in the picture. D. On the side view shot, line up the camera lens with the hands on a straight line back from the target. E. On the front view shot , line up the camera at a 90 degree angle to your chest. 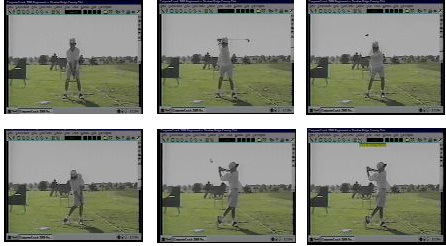 F. Let the camera run for several swings (each view) so that the beginning and end of your swing does not get cut off.